We may all be created equal, but we are certainly not all born into the same circumstances. In order for our system to work the way it is designed to things must remain this way. People must continue to fail or slip through the cracks of said system so that we not only have opportunities for exceptionally driven individuals to thrive, but also for those who are unable to make it past being the breakfast manager at McDonald's. We are all created equal, but it's what we do with that equality and the opportunity this state of mind affords us no matter how many advantages or disadvantages we 're born into. It is in this idea of equality that Jodie Foster seems to find an in to this story cobbled together by three screenwriters that seemingly wants to be about something, but in the end is more a slight encapsulation of the time we're living in than a piece of art that reflects or examines the time that has spawned it. Money Monster is Foster's fourth directorial feature and undoubtedly her biggest film to date, but it is this bigger feel, this corporate mandated aesthetic and approach that hinders more than helps in whatever Foster's actual objective might be. And so, it begins by Foster and her team of screenwriters (including Jamie Linden, Alan DiFiore, and Jim Kouf) looking at how the little man might take on the privileged and exploring equality from that perspective, but as we come to learn more details about the situation and the plot becomes more clear in that it is going to blame the downfall that was the catalyst for the outrageous (but not unbelievable) actions of one of our main characters on a single bad guy who did a single bad thing instead of making this an amalgamation of bad choices and ethically wrong dealings there is a hint that it might become more about equality in the sense of taking responsibility for ourselves and our actions whatever they may be no matter where we fall in society's class system. Had Money Monster delved more into an idea Dominic West's character spouts near the end of the film and come to something of a less pleasant conclusion, but a more realistic one I imagine the film might have struck more of a nerve, but as it is and as it goes Money Monster is simply a neat little thriller that is consistently entertaining. 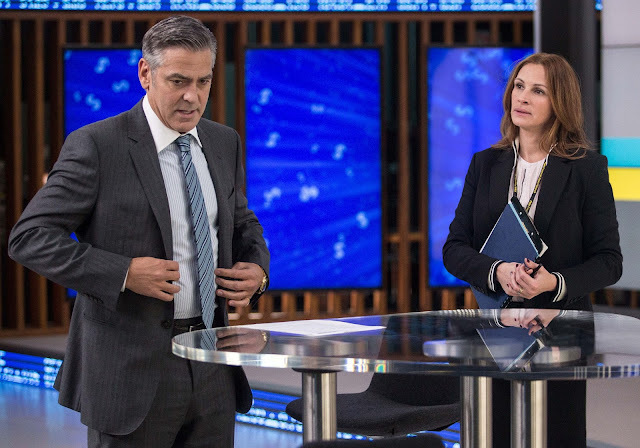 Lee Gates (George Clooney) and his director Patty (Julia Roberts) discuss their show prior to going on air. Lee Gates (George Clooney) is a financial whiz with his own TV Show on a financial network who gives viewers stock tips and other things of the same ilk. Gates is very much a Jim Kramer type with the same gimmicks and outlandish personality, but given this is George Clooney there is a sense of charisma and charm about the guy. We might learn that all he has to live for is his career given he's been married three times with each of them failing and an estranged child he knows little about other than the fact he signs a check once a month, but our biggest source of insight around Gates is actually his relationship with his director/producer Patty Fenn (Julia Roberts) who not only seems to run his show, but large portions of his life as well. One of the more interesting aspects of Money Monster is that it more or less takes place in real time and in attempting to accomplish such things we get the double edged sword of seeing some moments in a hyper dramatic form that might otherwise feel more mundane and yet there are other moments of real tension, where Foster and her editor create scenes worthy of pushing us to the edge of our seats. It is during a Friday broadcast of Gates' show that an unidentified man wanders onto set holding two boxes and a gun. Kyle Budwell (Jack O'Connell) is a truck driver who makes $14 an hour and someone who mistakenly took Gates' advice after inheriting $60,000 from his mother after her passing. At the tender age of twenty-four Budwell has seemingly found himself in over his head within the context of his life and has thus resorted to sticking it to the man in the most literal sense he could imagine. Budwell proceeds to take the entire production hostage as he pulls out a vest with a bomb strapped to it and makes Gates put it on. Budwell then puts his finger on the trigger and claims that if he lifts his thumb the whole place blows. What does he want? Budwell invested that $60,000 in a company called IBIS after listening to Gates say it was, "safer than you're savings account," and in turn lost it all when IBIS lost a total of $800 million. Budwell wants to know why. He wants to know what happened and he wants those responsible for what keeps being referred to as a "glitch" to explain why they felt so free to play with other people's money and well-being. 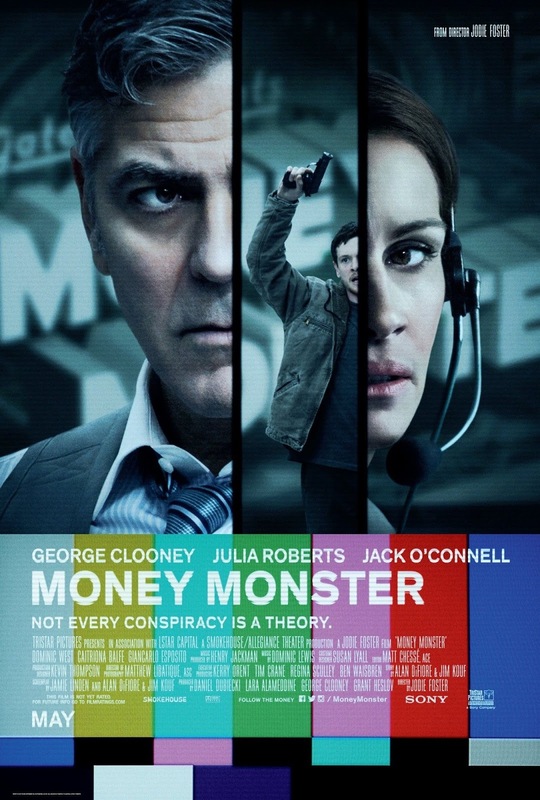 Money Monster is an interesting beast. It so clearly wants to be a heavy handed dramatic piece that comments on the crooked and the corrupt of Wall Street and how these stockbrokers and CEO's play so freely with other people's money that the actual repercussions their actions don't seem to matter. Foster clearly wants to comment on the idea of how big banks make things so complicated to understand that they alienate a large portion of the population allowing the people at the top to more or less do whatever they want given they can explain their way around it in a way the everyman won't understand, but in the shadow of films like The Big Short and The Wolf of Wall Street, Money Monster comes off more pedestrian. At a mere hour and thirty-seven minutes the film is a tight-knit thriller akin to something we might have seen in the nineties as directed by Phillip Noyce, but it is also evident Foster is interested in creating a kind of homage to Sindey Lumet in the vein of Dog Day Afternoon by attempting to create a portrait of human beings in their most basic of forms relying on their most basic of instincts and abilities. What this attempt ends up becoming though is an entertaining if not sometimes exciting thriller that stands to show us no matter how wealthy you become (even if you're George Clooney and Julia Roberts) that the right thing to do, morally, is stand up for the little guy and make sure those that can do, do indeed follow through. This obviously makes the stars clout and persona go up in the minds of the old blue hairs that will buy a matinee ticket to the film because they miss the days when movie stars defined the success of a film and studios actually made movies for adults, but in taking the movie as a whole it will leave little impact and certainly won't undo any perspectives one might have prior to walking into the theater. The key thing to appreciate about Money Monster is that it does its basic job diligently in that it provides an interesting, timely premise that comes with an inherent amount of drama and even offers a few twists on beats we expect certain elements and characters to hit. There is one scene in particular featuring a rather impressive Emily Meade that so goes in the opposite direction than what is expected that it not only adds layers to the character of Kyle, but it adds a whole new prospect for where the film could end up. While these moments might be too few and far between considering the slim running time there is enough compelling stuff here to keep us tuned in. Lee escorts Kyle Budwell (Jack O'connell) through the streets of NYC with a bomb strapped to him. While the script could indeed be considered timely and the ideas relatable if not discouraging, it is the actors that have to make these events connect on a level where the audience views the events from multiple angles rather than just the one the media purports or the one we assume given the contributing factors. To be honest, neither Clooney nor Roberts have anything especially daring or interesting to do here, but rather they are simply tasked with giving the scenes of high drama actual tension. In many ways, the two marquee stars are reacting more so than they are giving a performance, but they are good in what they're doing even if we've seen them do something similar before. Both the most interesting character and the most dynamic in terms of performance belongs to Kyle as played by O'Connell. Here, O'Connell is tasked with being the catalyst for the action that takes place and remaining the loose cannon throughout while simultaneously allowing for the audience to come to sympathize with his plight despite the fact he's the one holding the gun and being labeled the bad guy. Budwell is so clearly not the villain in this scenario though, and that comes through due to not just the speech he has prepared and intermittently shouts out on live TV, but more it is due in large part to the manic looks O'Connell allows to spread across his face showing us he has as little an idea of what he's actually doing there as we do. That Kyle, as a character, is genuinely looking for an explanation as to how his life ended up where it has is both desperate and devastating. That he's not even looking for a way out, but more for some type of justification makes his journey all the more tragic. And though there is an insane supporting cast here that provides the likes of the aforementioned West, Caitriona Balfe, Giancarlo Esposito, Christopher Denham, Lenny Venito, and Dennis Boutsikaris jobs even if each isn't given much to do, it is O'Connell that comes away both as the biggest loser, but the only real winner. 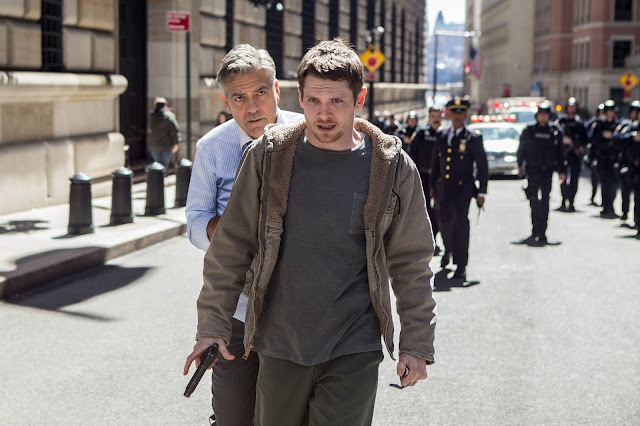 Clooney and Roberts simply come away unscathed leaving Money Monster a movie with big ideas and big stars, that is simplified for the masses in a fashion that makes it too broad to be as precise and stinging as it aspires to be. Still, it's rather entertaining and as a piece of entertainment-that counts for something.